As an English professor, I have read many books and articles on writing, but have found very few I could recommend to my students. 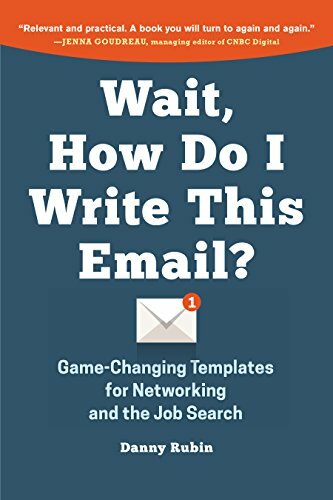 Usually, I’m limited to books every writer knows like “Eats, Shoots and Leaves.” With “Wait, How Do I Write This Email?” by Danny Rubin, I finally have an additional book to recommend to all of my previous and future students. As much as I enjoyed the whole book (in these 200 pages, Danny Rubin includes many templates for not only writing the titular emails, but also how to network, write handwritten notes, resumes, and more which are well worth the read and that I know I’ll be using again and again), these sections aren’t the true strength of this book. No, the true power of Rubin’s book can be found in the first 25 pages. What can be this good that it would overshadow the professional templates and other advice? It’s a chapter on what Rubin calls “How to Write Everything Better” and he’s right. He focuses on the two most important criteria of professional writing: how to be brief and how to be interesting. Which one of these provides a more thorough picture for you? Which one will stick with you even after you stop reading this review?